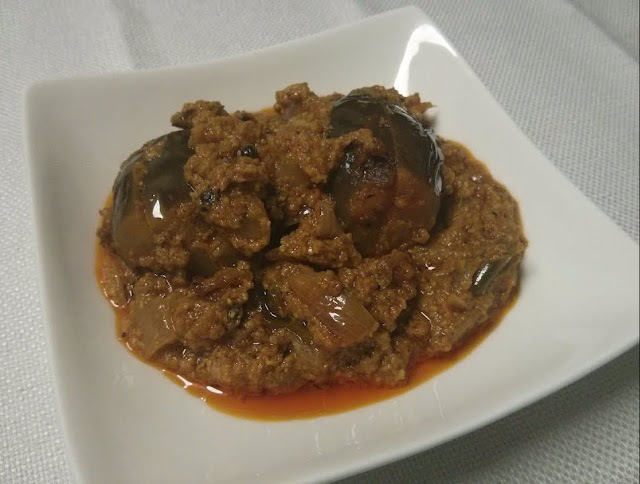 Brinjal Curry Recipe is a simple and easy dish to prepare and tastes delicious with biryani. Brinjal Curry Recipe is prepared in different ways in different regions. 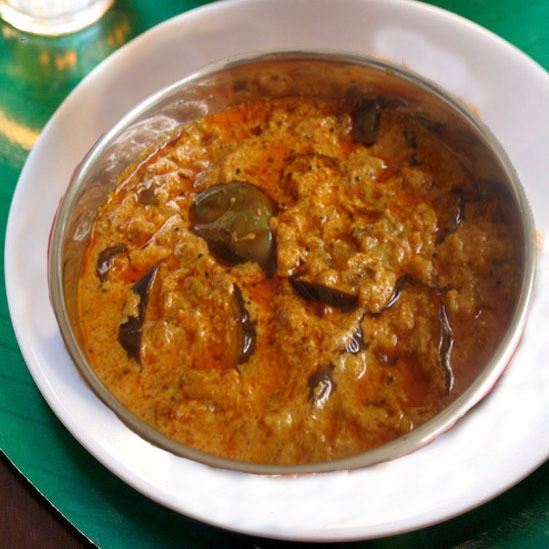 I have followed the style which is used in Ambur which is famous for its delicious Brinjal Curry. Brinjal Curry makes a good combination with biryani. It's a simple recipe and can be made with limited ingredients. The texture of biryani along with the flavours of spices and make a great dish. To begin the preparation of Brinjal Curry, first in a pan add oil, wait till the oil heats up and then add in the mustard seeds, peppercorns, curry leaves and sliced onions, fry till onions become translucent. Then add in tomato and cook till it leaves oil on the side of the pan and then add in the ginger garlic paste sauté it well till the raw smell goes away. Next add in the brinjals and mix well. Next add in the spice powders. Chilli powder, coriander powder, turmeric powder, salt and mix well. Soak the tamarind in water for about 20 mins and squeeze out the water. And then add in the tamarind water in the pan and cook till the brinjals become soft. Next dry roast the peanuts, sesame seeds and coconut take in a pan and cool down then grind that into a coarse powder. Add the ground masala to the brinjal gravy and mix well. Allow it to simmer for 2 minutes and then switch off the flame.